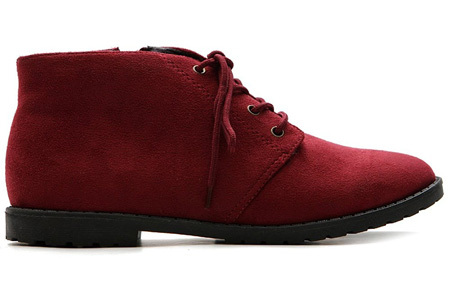 The neck of the women’s burgundy suede shoes is slightly above the ankle. As like hiking boot the soles are made of rubber. So they are not slippery at all when they are wet. Therefore you can use them in the snow. But it is not recommended for mountains or deep snow. They are very cute and comfortable to walk. The brand name of these shoes are OLLIO which offers the best quality, stylish and an affordable women’s footwear.